Chi helps bridge our tech and arts community in Silicon Valley. What better way to create community is connecting local businesses and organizations through volunteerism! Each year headquarters gives awards to regions for outstanding Corporate Social Responsibility projects. This year’s CSR initiative is focused around education. To work towards Acer’s mission of breaking barriers between people and technology, Acer employees are invited to volunteer as mentors for at-risk youth (ages 12-19). During the poetry workshop Acer employees and youth are able to enter into a dialogue and collaborative through art and poetry about issues that affect our youth; bridging our tech and arts community. 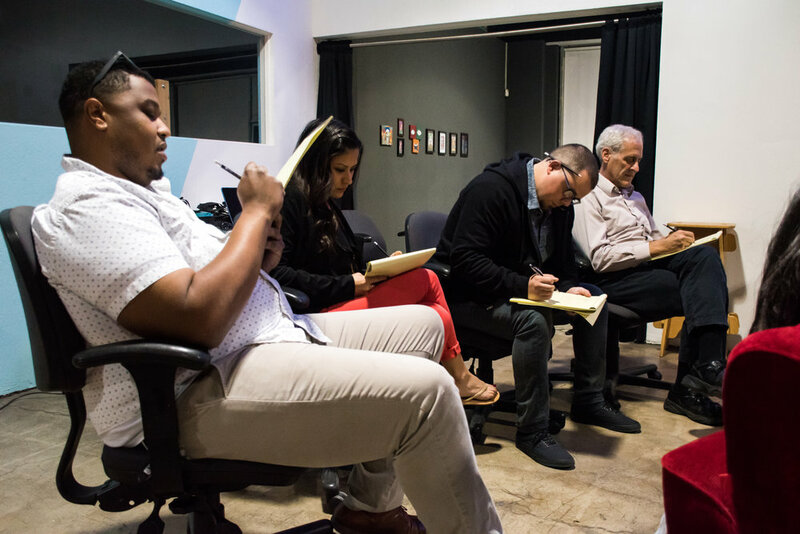 The poetry workshop provides a safe space to speak and create content that will be used to collaborate with the digital workshops in film, photography and music! Topics can include effects of social media, mental illness, career choices, truancy, etc. Follow our campaign right here! Week 2 - 11/12: It’s Poetry Week! We feature our favorite poems, youth poems and collaborate with Acer Employees to create their own “Write The Next Line” poem. Macla’s DMCStudio visits Acer’s volunteer info session on 11/15. Week 6 - 12/10: Workshop #4 Topics: Where will we be in 40 years? (Environment + Technology) + Is the pen mightier than the sword? I really enjoyed the poetry workshops with Acer, because it brought together different generations through writing and spoken word. It was a great space that provided a platform for me and other youth to talk to adults about issues that we strongly believed in, and have them listen and discuss with us, which is not an experience many youth are fortunate enough to have. I learned that there is a way for youth to find an outlet for youth to thrive in, rather than drown in the darkness that is gangs, violence, drugs, etc. I learned that there is a way for youth to express themselves in a calm and peaceful manner that will allow them to be heard by those who need to hear them. It is so important for our youth do discover the arts because it promotes imagination, imagination promotes creativity, and creativity promotes innovation. We cannot thrive as a society if we do not have innovation and creation.